Istanbul is the biggest city in Turkey, built by the Byzantine emperor Constantine, with its first name being “Constantinopolis”, – the town of Constantine. It’s a city with one foot in Europe and the other foot in Asia and the Bosphorus Trait being the physical border of the two continents. We have been in Istanbul and done our thorough research to find the best place to stay on a normal budget, the best places to eat, to go out in the evening & the museums and monuments to see. We have put together an itinerary for three full days in Istanbul, featuring what you should do exactly each hour of the day.This Travel Guide & Itinerary includes all costs, maps, travel tips and useful information you need to have 3 amazing days in Istanbul. – What is the best hotel to stay on a medium budget, so that you have easy access to all the activities mentioned while being in a safe and secure zone of Istanbul. – How to get from the Airport of Istanbul to the center of Istanbul. What are the prices you should pay for a Taxi? How to use the metro to save money for your transportation from the airport of Istanbul to the hotel. – Where to eat in Istanbul and what dishes to try in each restaurant that we have included. How much it costs to eat in each restaurant. – Which Turkish Hammam to go to. There are tens of Hammams in Istanbul. We chose the best one for you. Costs, map, opening times information. – Ferry Schedules and costs for crossing the Bosphorus to different places of Istanbul. – Information on the monuments we have put in the itinerary plan. Costs of tickets and entrance fees, opening times, things to see. – Shopping information on the best Bazaar to go to. – Information about the Egyptian Bazaar. – Where to taste the best Turkish Kebab. Map of the restaurant, costs of dishes. – Information about the best Bosphorus Cruise to choose from the various ones offered. How to do a Bosphorus Cruise with only 20 TL. – Where to eat the best famous Baklava – the Turkish delight that you will fall in love with. Where to try the best Profiterol of Istanbul. – Online and offline maps with all the spots mentioned. – An hour-by-hour schedule for each day with all information included on how to start your day from the hotel and move around the recommended places. It’s like having your best friend showing you around Istanbul. 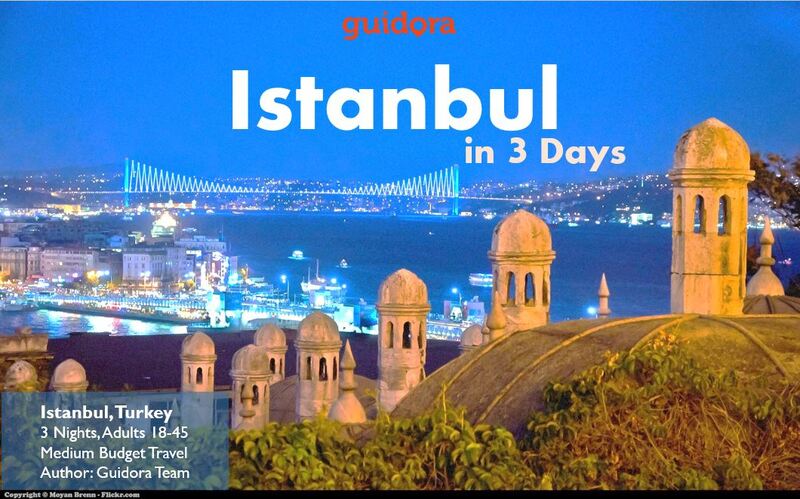 Get this 3 Days Travel Guide & Itinerary to Istanbul by clicking below!